Forget Piper and Alex, there's a hotter Orange Is the New Black couple, and they're not fictional at all! 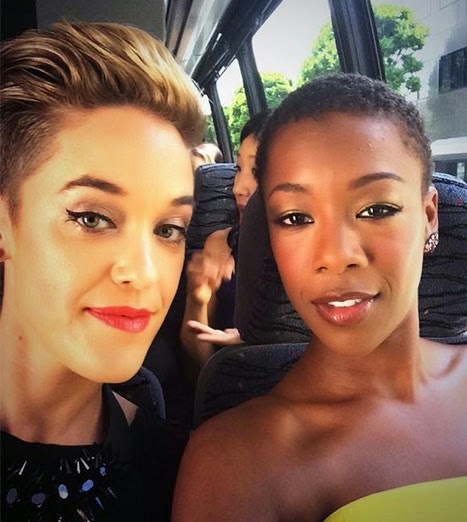 Lauren Morelli, a writer for the hit Netflix show, is dating actress Samira Wiley, who plays the beloved Poussey, Taystee's lesbian best friend. Morelli came out as gay in a touching essay for Identities.Mic in May, explaining that writing about the series' main character Piper Chapman (Taylor Schilling) and her ex-girlfriend Alex Vause (Laura Prepon) helped her to understand her own sexuality just months after marrying her then-husband. "I was nervous about the first love scene I'd written for Alex and Piper," Morelli wrote. "I'd loved writing it, loved watching a tenderness emerge in their relationship where passion always seemed to be the ruling principle, but by that time, I was so deep in my own self-doubt that I constantly felt like a fraud. I was sure it was bleeding into my writing. How could it not? I was married to a man, but I wasn't straight." They have posted a few social media photos together, keeping the captions vague.